I’ve been following the news reports about the three American detainees in Iran, now down to two because of the release of Sarah Shourd ("Iran releases American hiker," news story, Sept. 15). It’s good news for Shourd and her family, and I hope her traveling companions will also be released. Their families refer to them as "innocent hikers" who were exploring a scenic mountain area when they were arrested by Iranian authorities and charged with spying. But the three young adults used very poor judgment by traveling to an unstable part of the world and hiking in close proximity to a nation hostile to the United States. I suspect that they were trying to observe and learn firsthand about the conditions and people in that part of the world, perhaps in the hope of writing a documentary about their journey for both edification and profit. If not, why would anyone engage in such reckless behavior that has created an international incident, requiring much time and expense to secure their releases? Iran is signaling that it wants to join regional efforts to stabilize Afghanistan — presenting President Obama with an interesting diplomatic opportunity. He had solicited just such help from Tehran last month, but the administration has not yet responded to the Iranian feelers. U.S. policy is still in flux, but the administration appears ready for a limited dialogue with Iran about Afghanistan, perhaps conducted through the two countries’ embassies in Kabul. This position has not been communicated to the Iranians, in part because Washington is waiting to see whether Iran will return soon to negotiations about its nuclear program with the "P-5 plus 1" group. The administration’s dilemma is similar to what the Bush administration faced in 2006, when it requested and then spurned Iranian help in Iraq. The worry then was the same as now — that regional cooperation might blunt U.S. pressure on the nuclear issue. Several former senior Bush administration officials now view that stutter-step in 2006 as a significant lost opportunity. President Obama discussed U.S.-Iranian engagement with a group of columnists on Aug. 4. He said that in addition to talks about curbing Iran’s nuclear program, he favored a "separate track" for discussing Afghanistan, where the two sides have a "mutual interest" in combating the narcotics trade and fighting the Taliban. Obama told us that as part of Afghan President Hamid Karzai’s push for "reintegration" with the Taliban, Iran should join regional talks about stability. "Iran should be a part and could be a constructive partner," he said. In publicly endorsing such a dialogue, Obama was embracing a position that had been advocated in private for many months by Secretary of State Hillary Rodham Clinton. She is said to have pressed her case in one-on-one meetings with the president. Iran responded in several positive ways, which have been noted by U.S. officials. On Aug. 10, Iranian officials met in Tehran with Michael Steiner, a German diplomat who is serving as Berlin’s coordinator for Afghanistan and Pakistan. Alaeddin Boroujerdi, the head of the foreign policy committee of Iran’s parliament, "voiced Iran’s readiness to cooperate with other countries and help resolve the crisis in Afghanistan and fight drug smuggling," according to a story in the Iran Daily. The Iranians are said to have conveyed a similar positive message to Italian diplomats. Iranian President Mahmoud Ahmadinejad wants to control any channel of dialogue with Washington. On Aug. 24, he appointed his own special representative for Afghanistan, a hard-liner named Abolfazl Zohrevand, who is deputy chief of Iran’s national security council. The Iranian president named three other special representatives as well, to further consolidate his power on key diplomatic issues. Though Ahmadinejad continues his sulfurous anti-Israel rhetoric, over the past year he has been, in Iranian terms, an advocate of engagement with the West. Iran has made other gestures that suggest it is ready for dialogue on Afghanistan. Its foreign minister, Manouchehr Mottaki, attended the Kabul conference hosted by Karzai in July to encourage reconciliation. And the Iranians this month are said to have signaled a willingness to cooperate on Project Global Shield, a program to limit transportation of precursor chemicals that can be used to make explosives in Afghanistan. The question for the Obama administration is whether to take up these feelers. Advocates argue that stabilizing Afghanistan is a strategic priority and that the United States should seek help wherever it can. They also argue that rather than undermining talks on the nuclear issue, contacts on Afghanistan could be an important confidence-building measure. Skeptics contend the Afghan gambit would dilute the main focus of Iran policy, which is stopping Tehran’s pursuit of nuclear weapons. That same logic led the Bush administration to pull back in March 2006 from its proposal for talks in Baghdad with Iran, after Supreme Leader Ali Khamenei had appointed a key adviser, Ali Larijani, as his representative. When I visited Tehran in August 2006, hard-liners there were still gloating over the stop-and-go diplomacy, which they said proved the United States was an unreliable partner. I hope the administration will open a U.S.-Iranian channel on Afghanistan soon, before the morass there gets any worse. It’s one of the best ways I can think of to undermine the Taliban’s morale — and bring all the key regional powers into a process that could allow an eventual withdrawal of U.S. troops. The only way to find out if Iranian signals are for real is to start testing them. Heli and Eli sell condos on Exodus Street, a name that evokes a certain historical hardship in a neighborhood that suggests none at all, the ingathering of the Jews having entered a whole new realm here. The talk in the little office is of interest rates and panoramic sea views from handsomely appointed properties selling on the Ashdod waterfront for half what people are asked to pay in Tel Aviv, 18 miles (29 km) to the north. And sell they do, hand over fist — never mind the rockets that fly out of Gaza, 14 miles (22.5 km) to the south. "Even when the Qassams fell, we continued to sell!" says Heli Itach, slapping a palm on the office desk. The skull on her designer shirt is made of sequins spelling out "Love Kills Slowly." "What the people see on the TV there is not true here," she says. "I sold, this week, 12 apartments. You’re not client, I tell you the truth." But wait. Deep down (you can almost hear the outside world ask), don’t Israelis know that finding peace with the Palestinians is the only way to guarantee their happiness and prosperity? Well, not exactly. Asked in a March poll to name the "most urgent problem" facing Israel, just 8% of Israeli Jews cited the conflict with Palestinians, putting it fifth behind education, crime, national security and poverty. Israeli Arabs placed peace first, but among Jews here, the issue that President Obama calls "critical for the world" just doesn’t seem — critical. Another whack for the desk. "The people," Heli says, "don’t believe." Eli searches for a word. "People in Israel are indifferent," he decides. "They don’t care if there’s going to be war. They don’t care if there’s going to be peace. They don’t care. They live in the day." See a story on Middle East envoy George Mitchell. The ADL is not happy with Time. They sent the magazine a letter today in response to its current cover article, "Why Israel Doesn’t Care About Peace." The gist of the article is that Israel is doing so well economically that affluent Israelis don’t really care about making peace with the Palestinians. The ADL finds this thesis (wait for it . . .) anti-Semitic. In a letter to Managing Editor Richard Stengel, ADL called on the magazine’s editors to issue an apology to readers, both for the timing of the article and its calling up age-old anti-Semitic stereotypes about Jews and money. The insidious subtext of Israeli Jews being obsessed with money echoes the age-old anti-Semitic falsehood that Jews care about money above any other interest, in this case achieving piece with the Palestinians,” wrote Mr. Foxman. “At the same time, Time ignores the very real sacrifices made by Israel and its people in the pursuit of peace and the efforts by successive Israeli governments of reconciliation. Q. In your opinion, what are the most important subjects for the coming year? The poll by Teleseker questioned 500 people. The margin of error is 4.4 percent. I have been to the West Bank, I have seen with my own eyes how the settlers walk around with machine guns, terrorizing the native Palestinian population. They are only in the West Bank to justify a continued Israeli military presence there; and they are armed to the teeth. Where did the settlers get their machine guns from? Where did the settlers learn that it is OK to hate Palestinians, that their presence in the OPT is justified even if it comes with the wholesale subjugation of a people? The settlers, the majority of them are trouble-makers who need to be removed from the Palestinian territories, asap. The killing of the settlers was simply a reminder to everyone meeting in Washington that they cannot continue to ignore the democratically elected leadership of Gaza, no matter how despicable the West and Israel may find them. Most Palestinians, apparently with the exception of Mahmoud Abbas and his cronies, find all Israeli leadership to be even more despicable, more criminal and more violent than Hamas—but alas, they are left with no choice but to deal with them, no matter how many innocent Palestinians they have murdered. Please don’t accuse me of advocating vigilante justice, because I don’t. But, those settlers are illegally squatting on Palestinian land, and the list of those responsible for what happened to them yesterday must include near the top the Israeli leadership that lured them from around the world into living in cheap, government subsidized housing with all kinds of welfare benefits so that Israel can continue its illegal military presence in the West Bank. Golda Meir said that there couldn’t be peace until the Arabs learned to love their children more than they hate Israelis… I posit that there won’t be peace until the Israelis learn to love their children more than they love the continued theft of Palestinian land. And all of this talk of “why, why, why did Hamas do this?” Take a look at this list of settler initiated crimes against Palestinians from the last few weeks. What type of superhuman moral restraint do you expect Palestinians to continue? How long must they be intimidated by these thugs before they strike back? How long would Americans tolerate this sort of thuggish behavior before they fought back? Tony Blair "misread" Iran’s view on efforts to build a democracy in Iraq after the 2003 invasion, a former UK ambassador to Tehran has said. 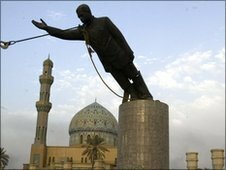 Tehran did not wish to "destabilise" efforts to establish a government after Saddam Hussein’s overthrow, Sir Richard Dalton told the Iraq inquiry. Mr Blair said Tehran was worried about a "democracy on its doorstep" and ended up aiding al-Qaeda-backed insurgents. Sir Richard said this was "exaggerated" and Iran did not want anarchy in Iraq. The Chilcot inquiry is continuing to examine the UK’s involvement in the 2003 military action in Iraq and its aftermath. He suggested that Tehran and al-Qaeda had a "common interest" in disrupting US and UK-led efforts to bring stability to the country.